Exeter Chiefs have drawn up plans and submitted them to the city council for a stadium development that will double the capacity of their Sandy Park home. The club want to develop three of the grandstands to take the stadium capacity from 10,750 to 20,600. The Chiefs also want to expand their banqueting and conference facilities at the site to help generate the income that will underpin their efforts to build on their fifth place finish from last season that meant they qualified for the Heineken Cup for the first time ever this year. "I predict that in three to four years we will average an attendance of about 13-15,000," chief executive Tony Rowe said. 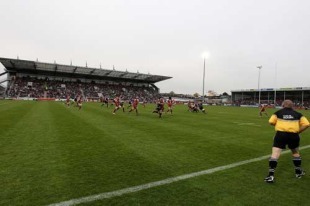 "We will not fill the ground regularly but a 20,000 capacity is what you need to play at the top end of European rugby and host Heineken Cup quarter and semi-finals. This will give us the headroom when we are playing in big games." Exeter have planned the development over a five-year period and as well as expanding the ground, they will increase their car parking capacity from 150 to 400, develop new areas for coach and bus transport and build a new television compound. The Chiefs have been one of the success stories of recent seasons. After their promotion in 2010 they have quickly established themselves in the Premiership as one of the most forward-thinking and fan-friendly clubs in the league. With the expansion the aim is to further build on their current successes. "If we can get planning permission we will look to start the work next year," Rowe said. "We are doing it in an anti-clockwise direction starting with the west grandstand where we will be adding extra seats and expanding the conference facilities by 50-70%. We will move through it when we can afford it."